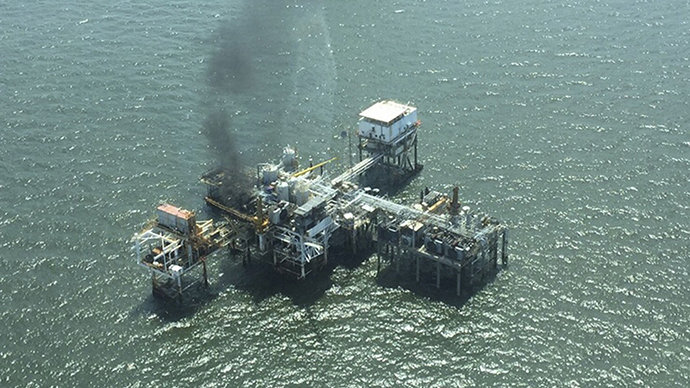 A fire broke out early Friday morning on a small oil platform in the Gulf of Mexico, forcing the evacuation of 28 workers. No injuries were reported, but a 1.4-mile oil slick was visible in the water. The oil platform is located 20 miles east of the tip of Louisiana. The rig has been shut down, according to the Coast Guard, but the platform still holds an estimated 5,000 gallons of crude oil. Crews in response vessels are on site working to extinguish the blaze. Texas Petroleum Investment, which owns and operates the platform, has halted production, Reuters reported. "The production platform where the fire occurred gathers oil and then pumps it through a pipeline so there is little oil stored on site and all wells feeding the platform have been shut down," David Marguiles, spokesman for Texas Petroleum Investment, said in an email to ABC News. While the mishap is still under investigation, a company statement said a compressor on the platform is believed to have caught fire. The platform is used to gather some 90,000 gallons of oil a day from a field of 50 to 60 wells, Marguiles said. Texas Petroleum Investment is a Houston-based, private exploration and production company with operations along the Gulf coast of Texas, Louisiana, Mississippi, and Alabama, according to its LinkedIn profile. The company was founded in 1989 and operates more than 2,000 producing wells, it said. Louisiana’s offshore crude production averaged about 14,000 barrels a day in March, according to state data. Total Gulf production in federal waters, which are more than three miles off the coast, was 1.46 million barrels a day in February, according to the Energy Information Administration. The lost output from the well is small in comparison to the total daily oil production in the region, but it comes the same week as a pipeline leak in Southern California that spilled crude oil onto beaches, once again sparking concerns about responsibility and environmental considerations. Elsewhere, the National Oceanic and Atmospheric Administration has just released a report on the number of dolphins dying from unusual diseases about the same time as the infamous BP Deepwater Horizon oil platform spill in the Gulf in 2010, which lasted five months.